It all started as a simple search, but there’s no such thing as a “simple search”. 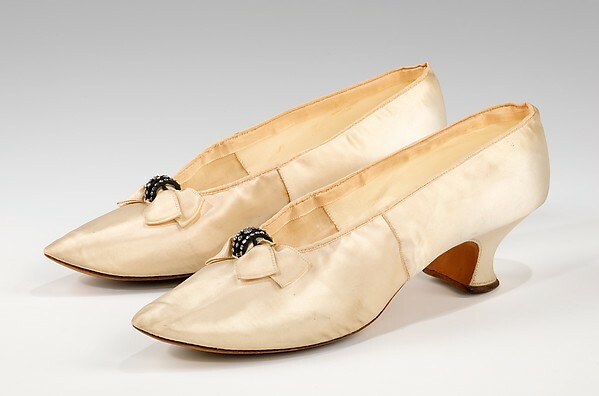 The Greco shoes at the Philadelphia Museum of Art were donated by Mr. Rodman A. Heeren, a name we came up against perusing both the collections at the Cooper Hewitt Smithsonian Design Museum and the Metropolitan Museum of Art. 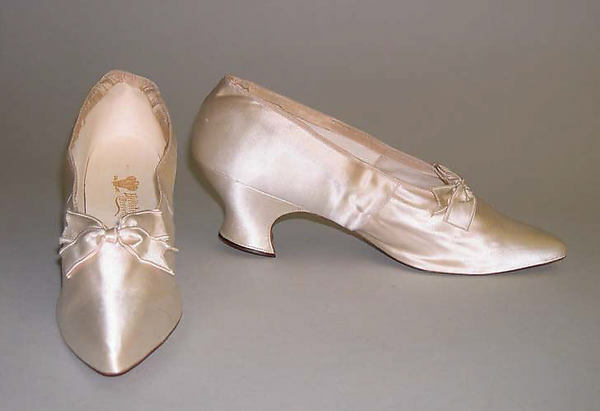 Mr. Rodman A. Heeren contributed the above collections with objects that belonged to his mother. Furthermore, donated in memory of his mother Fernanda Wanamaker. But who is Mr. Rodman A. Heeren? Mr Rodman A. Heeren was the son of the first marriage of Fernanda Wanamaker with Arthur O. Heeren, son of Count Heeren. The marriage was celebrated in Paris in 1909. The Heerens belonged to the Spanish nobility, and the bride came from one of the most prominent - and wealthy - American families. 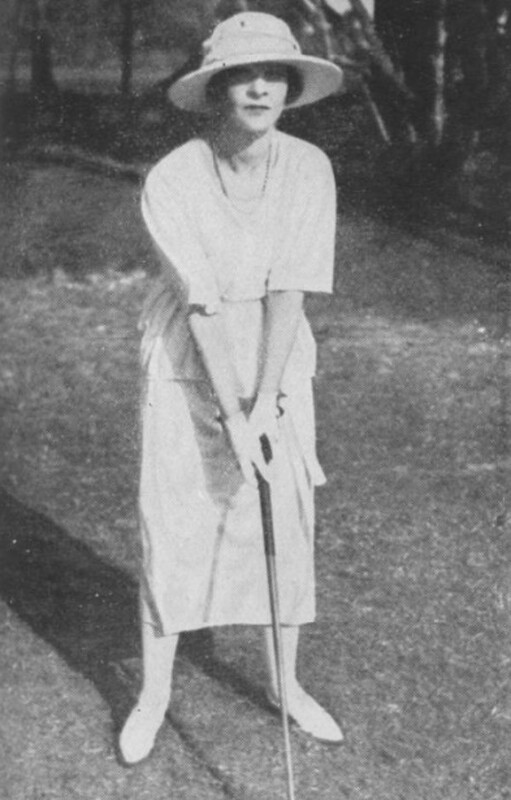 The couple continued to be settled in Paris, but Fernanda used to spend long periods in Palm Beach as well. 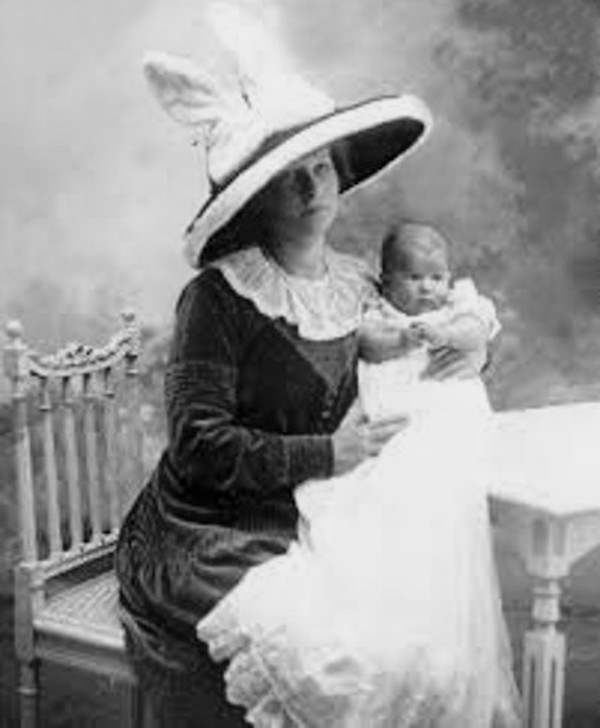 Fernanda Wanamaker (Dec. 9, 1887, Jenkintown, Montgomery County, Pennsylvania – Sep. 30, 1958, Hotel Continental, Paris, Paris, Île-de-France) was the eldest daughter of Lewis Rodman Wanamaker (1863-1928) of Philadelphia, and grand-daughter of John Wanamaker. 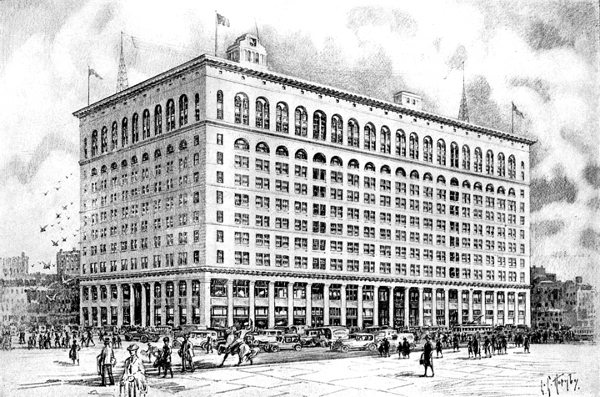 Her grandfather John Wanamaker had founded the Philadelphia department store that bore his name. 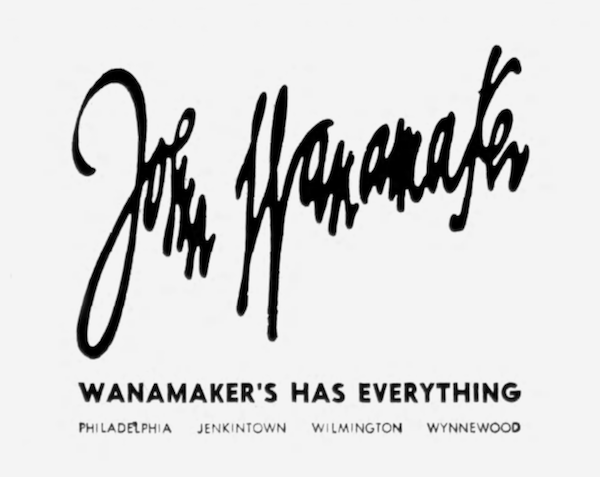 The family business started in 1861, when John Wanamaker, with his brother Brown, founded a men's clothing store in Philadelphia called Oak Hall. After his brother's death, Wanamaker purchased the abandoned Pennsylvania Railroad station to refurbished it into a store for men's clothing - and later for women's also - in the way of the London's Royal Exchange and Paris's Les Halles. The department store favoured the French production in order to offer a choice of the new fashion trends, and to replicate them, if we may. The business passed onto his son Roland and the experiment of the department stores - one of the earliest in America - was so successful that when her father Lewis Rodman Wanamaker died in 1928, Fernanda shared with her siblings an estimated $120 million trust. At her father’s death time, Fernanda had already divorced with De Heeren (1923) and got married to Ector Orr Munn (the following year). With the second husband, before another divorce in 1948, she lived between Manhattan and Paris, constantly paying attention to fashions as a family tradition. She was a real socialite, friend with Elsie de Wolfe, lady Mendl and the Duchess of Windsor. "Mrs. Ector Munn [Fernanda Wanamaker and Mrs. Harrison Williams, among others, chaired the American branch of Le Colis de Trianon-Versailles. In 1940, with the support of Lady Mendl and the Duchess of Windsor, they organized the exhibition Paris Openings to raise money for the French war charity. Held at the John Wanamaker Auditorium in New York, the exhibition featured evening dresses worn by members of the Windsor set. Each dress was chosen for its “hallowed memory,” a dress that had been worn on some “Great Occasion.” These costumes reveal the supreme and unsurpassed craftsmanship of the couture métier in the five years leading up to World War II. At the same time, they reveal how the Duchess of Windsor and her set conscripted fashion - the very expression of their blithe lives - as a unified display of their support for the war effort." The donations by Fernanda's son to the museums read like a who's-who of the high fashion of the first decades of 20th century (mainly French) with evening dresses by Mainbocher, Schiaparelli, Paquin, Madame Grés, Lanvin-Castillo, Balenciaga, Pierre Cardin, Balmain, Chanel, Dior, Givenchy, Doucet, hats by Caroline Reboux, Paulette, or Rose Valois, Gloves by Aris, Alexandrine and Harry bags by Cartier. 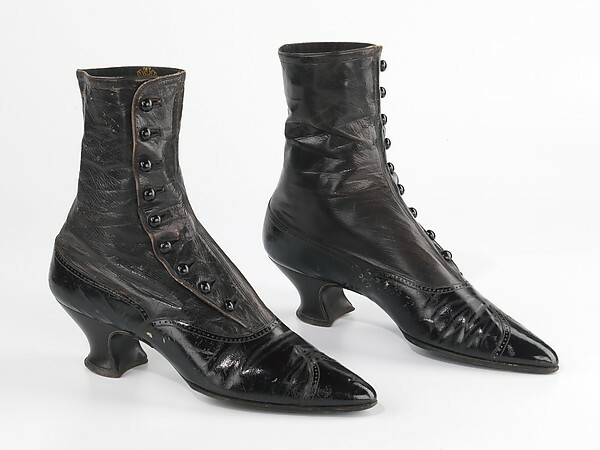 And finally footwear: shoes, bottes and galters. 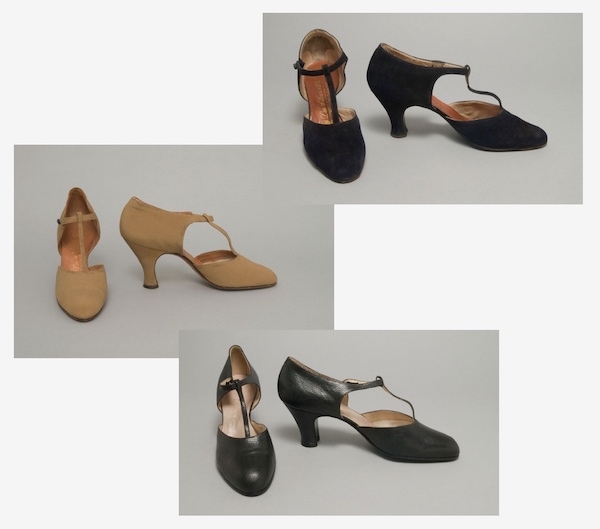 The oldest models are elegant and delicate evening shoes from the early 1900, by L. Perchellet and Hellstern & Sons, two of the oldest Parisian shoemakers dating back the 1870s (above). Worthy of note two series of models by two brands of Italian origin: Ducerf Scavini and Nicolas Greco (Twenties and Thirties). 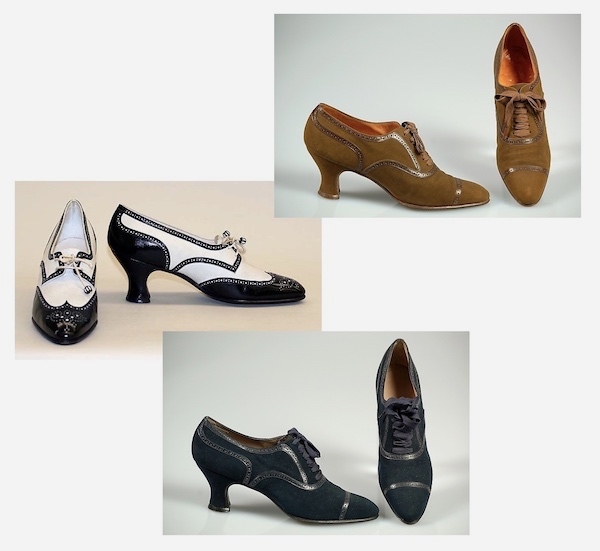 We can partially amend the Philadelphia Museum dates about the models by Ducerf Scavini: those are earlier than 1935, as the company was sold to the famous Italian bottier, Nicolas Greco, in 1934. While in London and New York, Fernanda visited Thomas and Nancy Haggerty Shoes, Inc. Looking at the collection it looks like she favoured elegant and simple models (Oxford, pumps and t-strap), avoiding the most eccentric styles of the time. Also the colours are sober: we found Oxfords by Thomas in many shades of grey, black and brown. And the same goes for the T-Straps and pumps by Ducerf Scavini and Greco. In other words, Fernanda Wanamaker fulfilled the beloved novelist/poet Sylvia Plath’s secret wish: one model/style in ALL seasonal colors. After all, money was not object for the heiress of the Wanamaker empire.